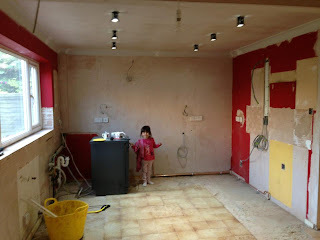 Blog From A Broad: dude, where's my kitchen? So, the day I've been dreading has arrived: our kitchen is gone. I've got a freezer full of food, a BBQ, slow cooker, electric grill, and camping stove so we're well equipped. I was worried about the logistics of washing the dishes without a sink (and no other sensible sink downstairs) rather than about finding ways to cook, but our lovely plumbers left our dishwasher connected. We're borrowing a camping sink (a basin with a stand) from friends, which will also come in handy. I think now that it's done and I've managed to do breakfast without any trauma, it doesn't really seem that bad. Ask me about this again on Wednesday, though. We went out for supper last night to our local pub, which was really nice. It was still warm(ish) enough to sit outside and let the kids run loose with their friends, while we had some lovely food and fizz with our friends. A very civilised way to end a long week. Everything else has come to a bit of a standstill as nothing can be done while they fit the kitchen. Then it's floor tiling, laying the laminate flooring, finishing off any plasterwork and electrics, and the utility room. And then we get a dog. No biggie. do you like our new kitchen?